TH E M R EP O RT | 45 SERVICING THE LATEST O R I G I NAT I O N S E R V I C I N G DATA G O V E R N M E N T S E C O N DA R Y M A R K E T SERVICING LOCAL EDITION Ocwen Tries to Fast- Track CFPB Ruling THE BUREAU FIRES BACK, ASKING A FEDERAL COURT TO DENY THE MOTION. GEORGIA // In early May, the Consumer Financial Protection Bureau (CFPB) told a Florida fed- eral court to deny Atlanta-based Ocwen's attempt at fast-tracking its constitutional challenge against the agency's structure. 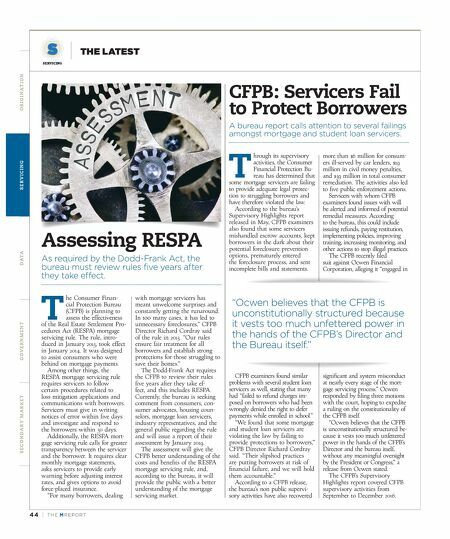 The CFPB said the mortgage servicer shouldn't get special treatment in the case, alleging it failed "every stage of the mortgage servicing process," Law360 reported. Ocwen had previously stated its opinion of the CFPB's struc- ture, saying in a release that it "believes that the CFPB is uncon- stitutionally structured, because it vests too much unfettered power in the hands of the CFPB's Director and the bureau itself, without any meaningful oversight by the President or Congress." "These defendants are not unique in challenging the con- stitutionality of the bureau, and have provided no legal authority or any other compelling reason why they are entitled to special treatment," the Bureau said. Ocwen's constitutional concerns include the bureau's single-director structure, which the company said violates the Constitution's separation of pow- ers clause. However, the CFPB argued that Ocwen's request to expedite the ruling "would result in exactly what the rule was intended to prevent: unnecessary delay and piecemeal consideration of the case," the CFPB said. In response to the CFPB's recent suit against the organiza- tion, Ocwen called the bureau "an unaccountable agency" and cited a number of apparent errors in its filing. "The Complaint is riddled with allegations about conduct that Ocwen already addressed— sometimes years ago—with refunds, credits, or other consumer remedies," Ocwen responded. "Moreover, the CFPB contends that on 'numerous' oc - casions or 'at least one thousand' times Ocwen has wrongfully started or completed foreclosures on consumers who were in the midst of applying for or perform - ing a loan modification. But, so far as Ocwen is aware—and the Complaint does not identify the loans—the CFPB did not actually look at the individual servicing files for these consumers' loans before making this allegation." Mortgage Efforts Send SunTrust Income Up THE BANK'S MORTGAGE SERVICING INCOME JUMPED $28 MILLION OVER THE PREVIOUS QUARTER. GEORGIA // For the first quarter of 2017, SunTrust Banks, Inc., headquartered in Atlanta, posted a net income of $451 million, or $0.91 per average common diluted share. This is a 3 percent increase over the previous quarter and a 4 percent year-over-year increase. "Our performance this quarter is the direct result of the invest - ments we have been making in strengthening our franchise and diversifying our business mix," said William H. Rogers, Jr., Chairman and CEO of SunTrust Banks, Inc. "2017 is off to a good start, and we remain committed to investing in client growth, im - proving efficiency, and increasing capital returns." Total revenue for the quarter was $2.2 billion, a $55 million in- crease from the previous quarter. Net interest income increased $23 million. The bank noted that higher mortgage-related income and investment-related income pushed the noninterest income up by $32 million. Mortgage servicing income posted a strong quarter, with a net income of $53 million over the previous quarter's $25 million. Still, this was a decrease from the previous year's Q1 income of $62 million. Mortgage production in - come was $53 million for Q1 2017, a decrease from Q 4 2016's $78 mil- lion, and a year-over-year decrease from Q1 2016's $60 million. At the end of Q1 2017, early- stage delinquencies were 0.72 percent, unchanged from the previous quarter. Excluding government-guaranteed loans, which account for 0.50 percent, early-stage delinquencies were 0.22 percent, down five basis points from the prior quarter and seven basis points compared to a year ago. SunTrust has seen a steady de- crease in nonperforming loans over the past several quarters, going from 0.70 percent in Q 3 2016 to 0.59 percent in Q 4 2016. The most recent data shows the ratio of non- performing loans at 0.55 percent. Total nonperforming assets were down $61 million from the previous quarter, which SunTrust attributes to the continued resolu- tion of problem energy credits. 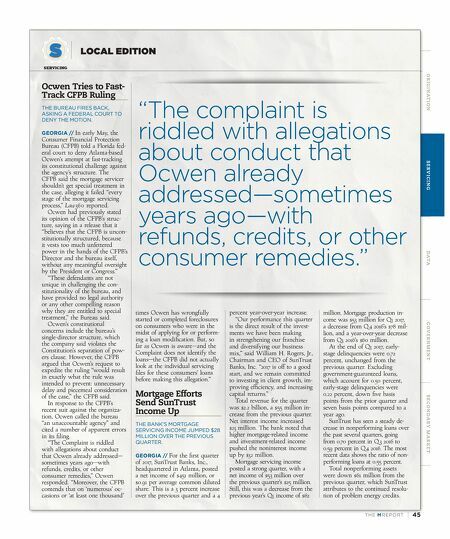 "The complaint is riddled with allegations about conduct that Ocwen already addressed—sometimes years ago—with refunds, credits, or other consumer remedies."